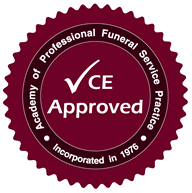 Funeral Directors and Embalmers in Idaho are required to complete 8 hours of continuing education annually. NOTE: Only 4 hours of the total CE requirement may be obtained from online or home study courses. Once you pass our course, you will be able to immediately download and print your certificate of completion. The following courses have been approved by the Idaho Board of Morticians.